NEWS that KRAFTY KUTS was coming back to town drew a 500-strong crowd to the KING STREET HOTEL last Wednesday, marking the UK DJ's third appearance at NUTSHELL BREAKS . 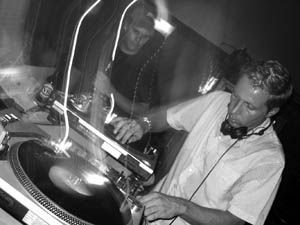 Like his last trip to Newcastle in July 2002, Krafty Kuts had Australian ex-pat FRIENDLY in tow, treating Novocastrian breakbeat fans to a feast of beats. As the first Nutshell Breaks event of 2004, organisers could not have started the year in better style. Voted Most Popular International DJ at the AUSTRALIAN DANCE MUSIC AWARDS , there was no doubting that Kuts would pull a crowd. Local DJs DECAFF, J*JAY and KATO warmed up the crowd before Krafty Kuts took over. His big hit Tricka Technology taken from the album of the same name was one of the opening tracks and instantly spun the crowd into a frenzy. Current favourites also crept into the set including the still-popular Satisfaction by BENNY BENASSI and the bootleg of NIRVANA 's Smells Like Teen Spirit . Having long held a reputation as a DJ who knows how to keep an audience on the dance floor for his entire set, Krafty Kuts did just that with the Newcastle crowd. Krafty Kuts was overheard to say that he ``could not believe how up for it'' the Newcastle crowd had been and said that it was one the best crowds he had played to. He also hinted that he would like to return later in the year. Nutshell Breaks resident DJ AUXILARY took over from Krafty Kuts before making way for Friendly, the Australian DJ-producer who has also become a regular Nutshell guest.